Summary: To put it bluntly I had avoided this classic ridge walk on previous visits to the Lakes. 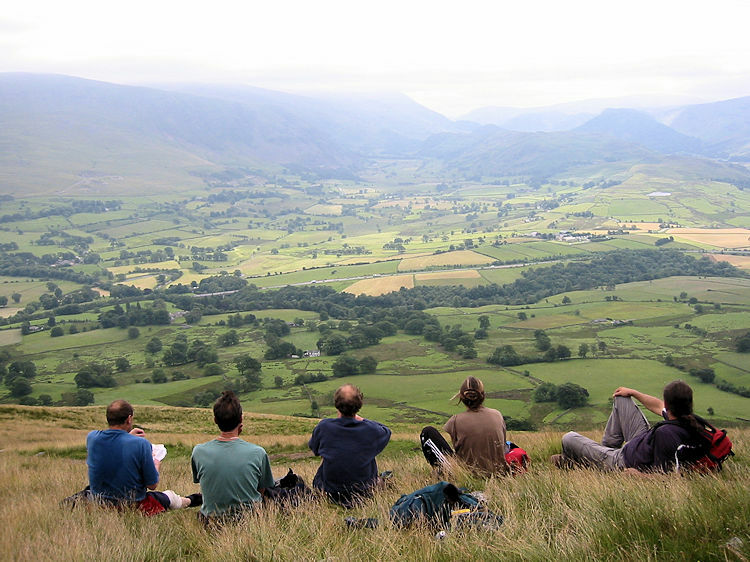 I had always looked in awe at Blencathra as I drove along the A661 from Penrith to Keswick. It's an awesome mountain to look at as you drive past and the distance glimpses of Sharp Edge from inside the car were frightening. I had done Striding Edge but the books had always painted Sharp Edge as more precarious and I was not going to do it until I was resolved to do so. And what better time than on my Stag weekend with all my walking buddies with me. And so, on this special occasion I set out with Deke, Dave, Steve, Chris and Ally to conquer my fears and finally notch up Sharp Edge once and for all. We were so lucky as we woke up to a glorious sunny morning with a promising weather forecast that predicted calm conditions, perfect for walking. Especially with Sharp Edge in prospect. 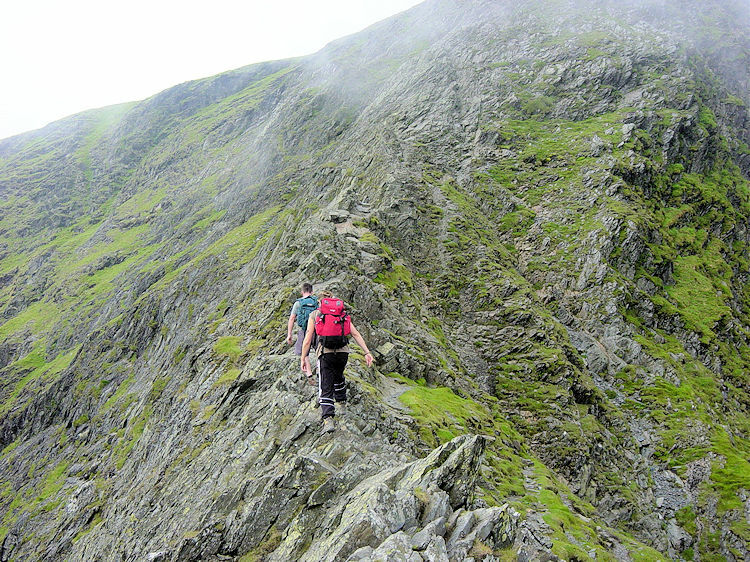 Deke was the only one who had done Sharp Edge before and he was encouraging us all that it would be no problem. I felt reassured but still nervous as we drove from Keswick to our starting point at Scales Farm. I glanced at the sky during the short drive to our beginning. True enough the clouds were few and far between, great stuff. We prepared and then set off on our journey, intrepid walkers banded together in anticipation and some in awe about what was waiting ahead. The walk began gently enough, climbing steadily, in sunshine to Scales Fell though it got steeper on the haul to Mousthwaite Comb. 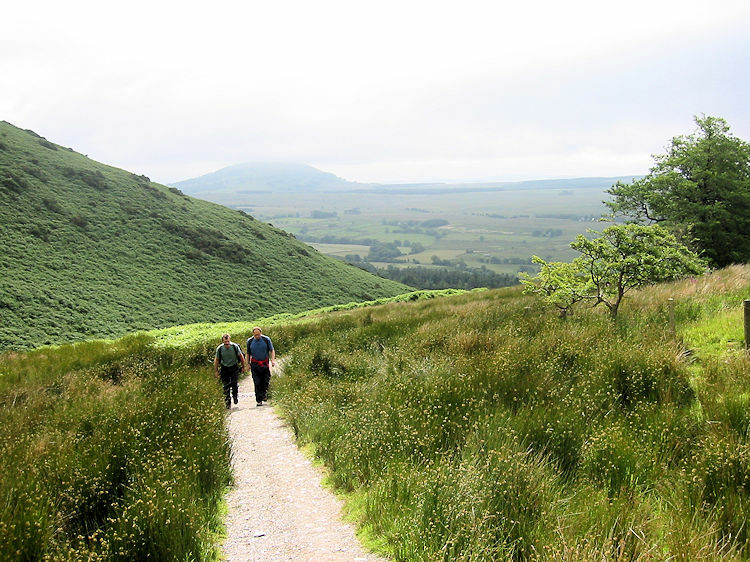 We made our way over the first ridge and only then while walking along the River Glenderamackin did the target of our fears come into view, our first sight of Sharp Edge. Darn it, cloud was rising from Scales Tarn below and spilling over the ridge, I thought to myself "I hope that is gone before we make the attempt to cross the precipitous ridge". Fortunately the cloud lifted and cleared from Sharp Edge just as we reached Scales Tarn. We all set off to the first real challenge at Brunt Knott with Steve in the lead and the rest of us in a line behind him. Just as I reach it Steve emerges from over the Knott on his way back "I have just had a look and I am not doing that" were his exact words. I tried to encourage him by saying "I am not exactly easy about doing it either but we have come this far. We have just got to do it now". 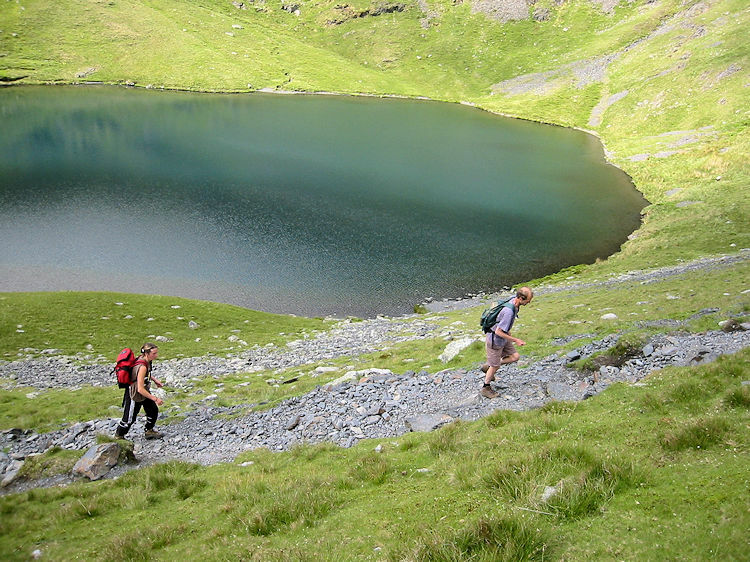 It was to no avail, he did not even pause as he headed back down to Scales Tarn. What had Steve seen? A little worryingly I wondered but I went onwards just behind Chris and Ally who were reviewing what lied ahead. As Steve met Dave on his way down to the tarn they spoke. What he said was enough to put my brother off. 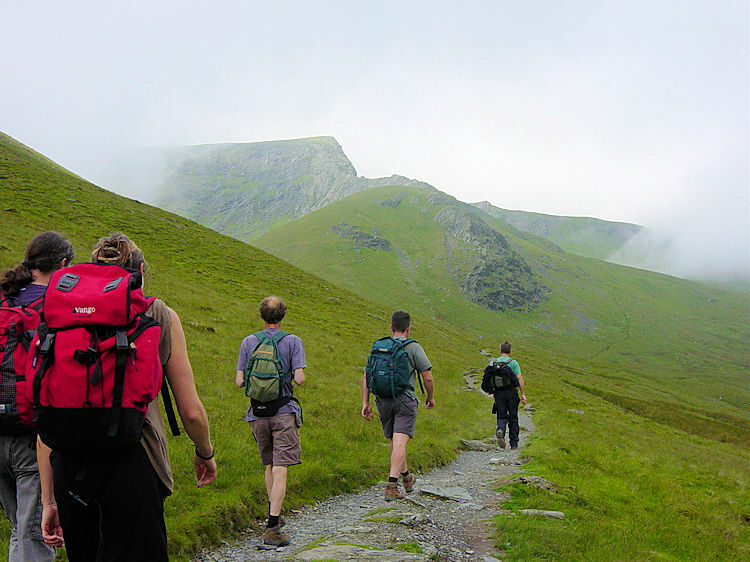 Together they headed past Scales Tarn and walked up the other side of the tarn to Blencathra top while the remaining quartet carried on across Sharp Edge. Chris and Ally led and reached Foule Crag while deke and I lingered on Sharp Edge and with Deke's reassurances I lost all sense of trepidation and began to enjoy myself on the edge. 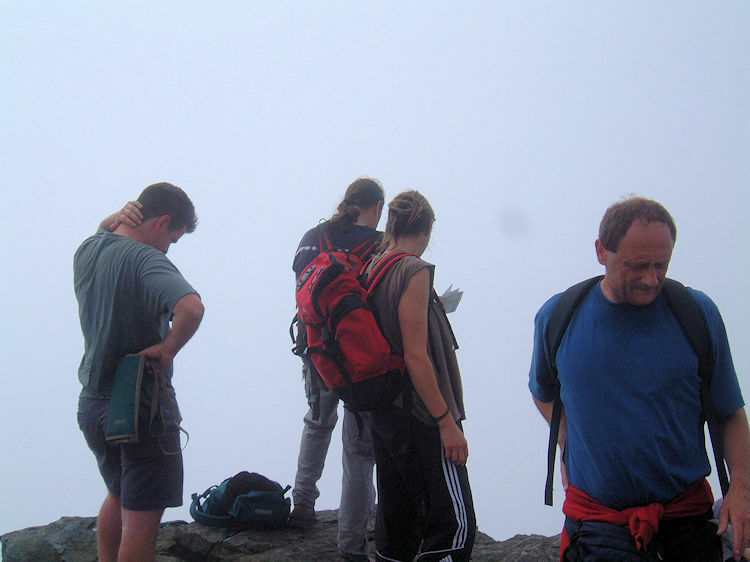 As I rounded Brunt Knott and saw the challenge of crossing Sharp Edge I could not see what had put Steve off. Yes, there is really only one option of staying on the crest of the ridge which could be worrying in wet and icy conditions but the visibility was perfect, it was very dry and as I could see it, no problem at all. In fact it looked easier than Striding Edge on my first occasion on the Lake District's other famous ridge walk. 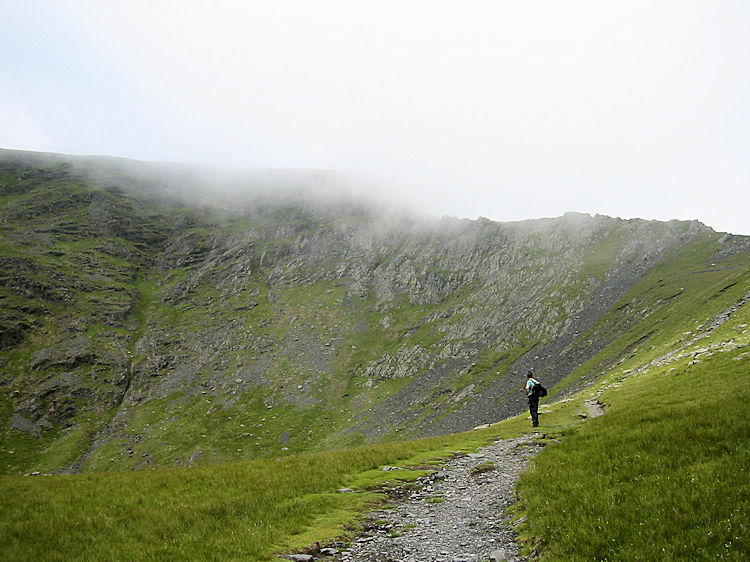 And so I began my crossing of Sharp Edge with no qualms at all with Chris and Ally just ahead of me and Deke immediately behind. I have to say I considered the crossing Sharp Edge to be a doddle. 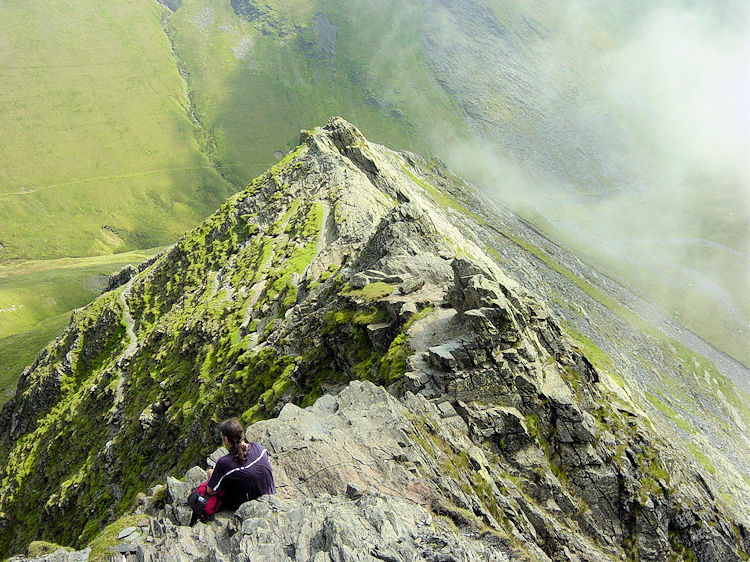 It seemed so easy to me and yet so thrilling so I stopped on the narrowest part of Sharp Edge and sat down to capture the occasion in my minds eye. While I sat Deke caught up with me and we sat together, both enjoying the precious views. While we sat and took the moment in Deke picked up three small stones and performed a juggling act on the very top of Sharp Edge. I walked on to take the photograph of his high level act and then watched on as he sat down for a little longer. 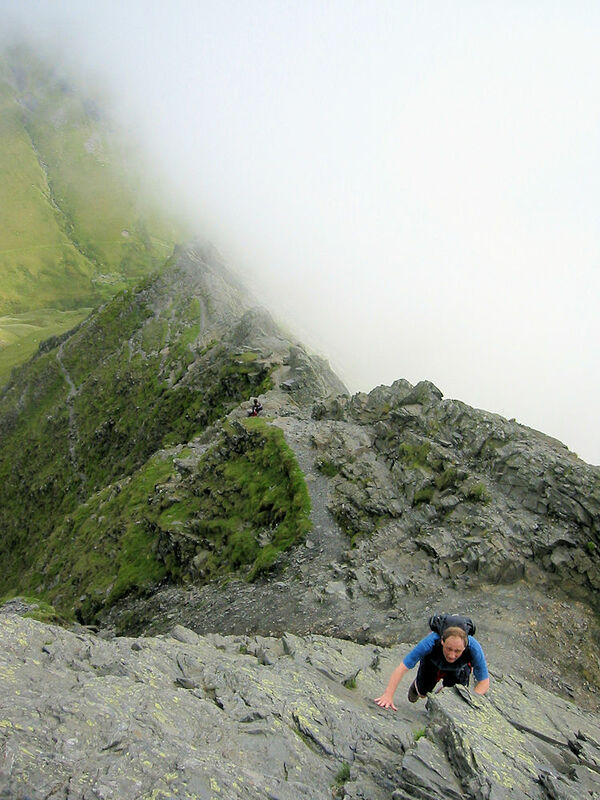 After crossing the thin crest and of slab Sharp Edge it ends at the wall of Foule Crag which becomes steeper the further you ascend. 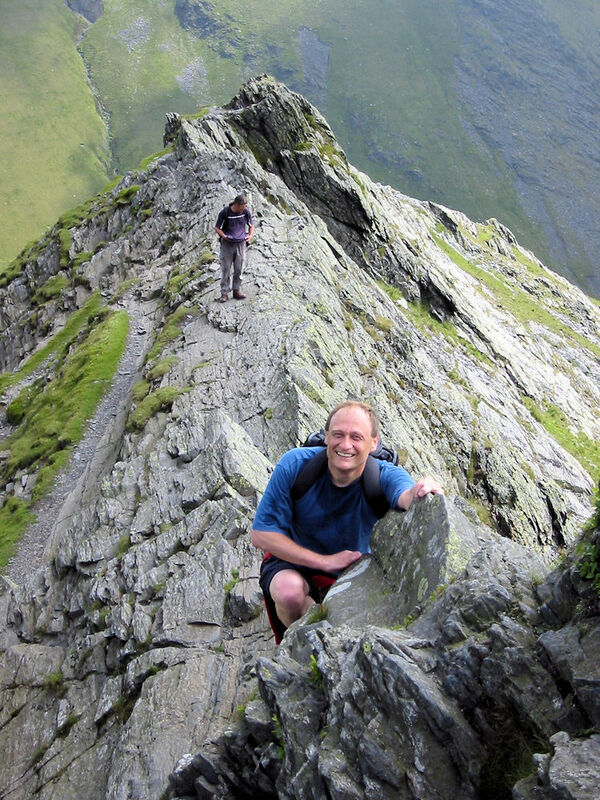 Foule Crag has to be scrambled, of that there is no question. 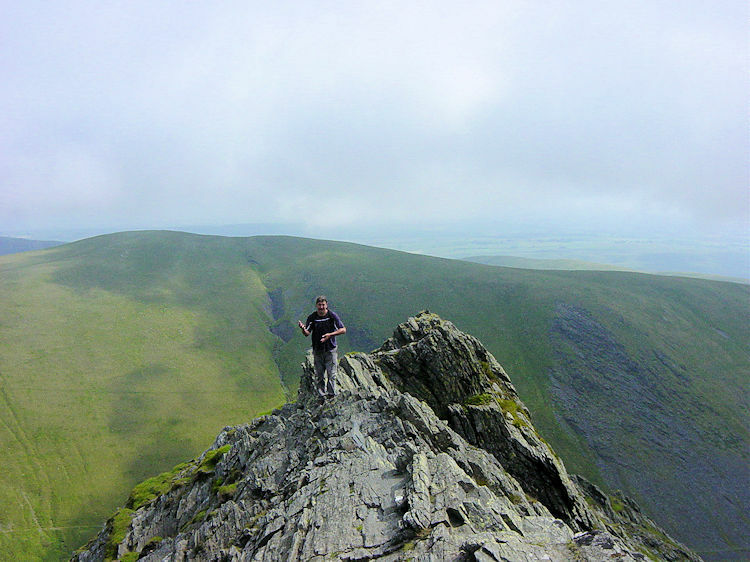 The use of hands and feet is necessary until the climb of Foule Crag is completed and the summit plateau of Blencathra is reached. Although it is a tiring scramble it is not a precarious one. 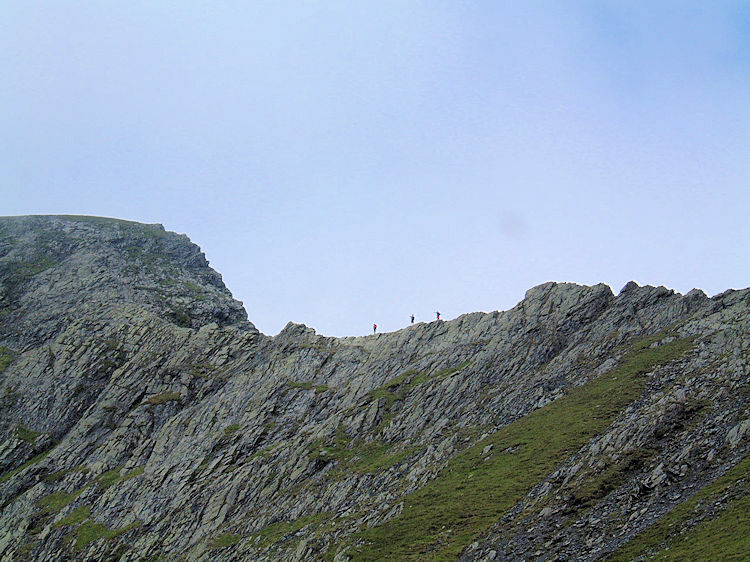 I never once felt I was as exposed as I was on the Jack's Rake route on Pavey Ark. 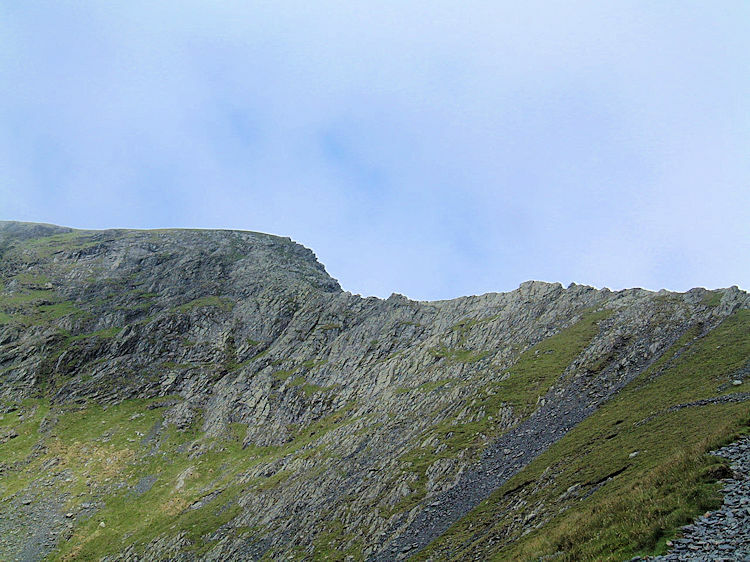 While scrambling up Foule Crag I even stopped and took time to look back to Sharp Edge on the occasions I paused. It is safe to say I never found Sharp Edge a problem at all. I wish Steve and Dave had done it and if they had the choice again I am sure that once reassured they would do it easily. I promise I will do it with you both one day in the future guys. Once the scramble was completed we rested on the plateau just below the summit of Blencathra while Deke who had taken a sojourn on the Edge made his way up to us. 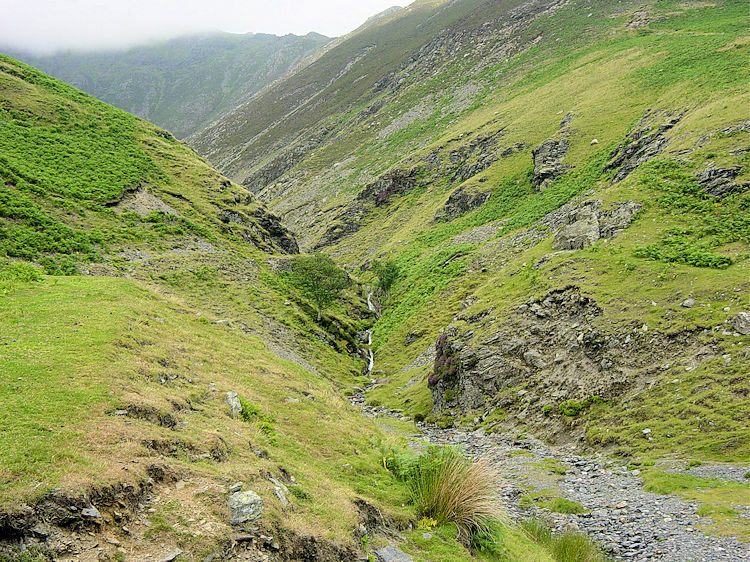 The rigour of crossing Sharp Edge and climbing Foule Crag coupled with the steep descent of Heron Crag to Rydal the previous day had left me with one legacy though. My right knee was now shot. After reaching the summit of Blencathra and meeting Steve and Dave we began to make our way down to Threlkeld via Knowe Crag and Blease Fell. For me it was absolute murder and I am indebted to you Chris for hanging back and encouraging me down. Thanks. At about 500m we stopped for a break and Steve bandaged my knee up to add further support. Again, thanks to you Steve as it helped a lot. 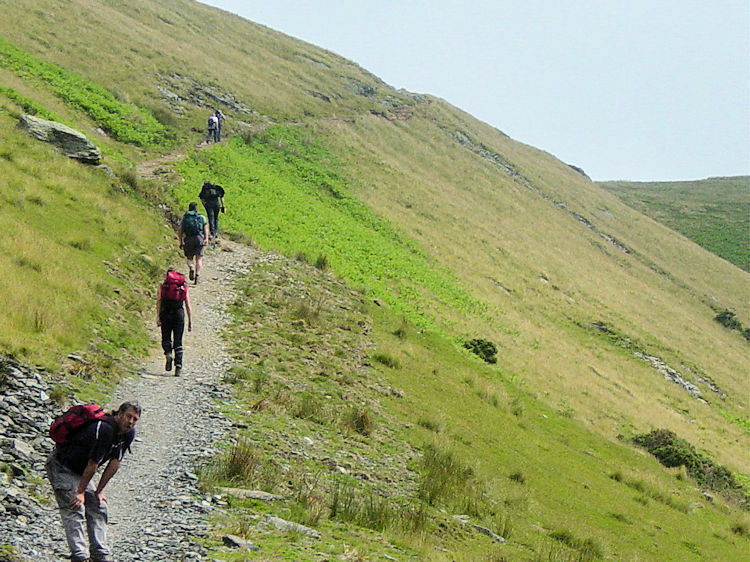 After a lovely break we all headed back to Scales Farm on a lovely track skirting Blencathra, a now conquered mountain. We did the last part down a grassy field on our backsides, very funny, always remembered. This was a fantastic walk on a fantastic day during a fantastic weekend. It was a major achievement for me and I am certain it would be a memorable experience for any who choose to do it. It was brilliant.